Adult single-limb circuits for Life Products LP4™, LP5™, Aequitron LP6™, LP6 Plus™, LP10™, Lifecare™ PLV®-100 and PLV®-102 ventilators. Includes 6" patient tube and trach elbow adapter, 15mm I.D. 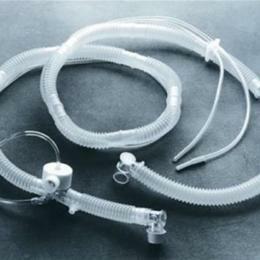 ; 60" patient air tube; 70" exhalation supply line, 0.137" I.D. ; 70" pressure sensing line, 0.200" I.D., and tip adapter; 189" cascade tube and elbow adapter, 22mm I.D., silicone diaphragm.